PETALING JAYA: Following the recent positive policy changes to liberalise the Malaysian property sector and news that Hap Seng Consolidated Bhd acquired a 50% stake in Menara Citibank, analysts have mixed views on the local property market outlook and the performance of commercial properties. In its latest report, OSK Research said in 2009, office space in the Golden Triangle and central business district should fare relatively better than other areas, given the limited new supply of office properties. This is despite the impending strong competition from Bangsar, Pantai and Petaling Jaya areas commencing this year, coupled with other factors such as over-congestion and astronomically high rental rates in centralised areas that are likely to intensify the decentralisation trend. “Having said that, we do not expect many multinational corporations to move into cheaper outer suburban office alternatives. “Most foreign CEOs are likely to prefer close proximity to the city infrastructure and city-based clientele,” the brokerage said in a note to clients. OSK said to date, office space buildings which had been in existence for years had an estimated gross cap rate of 7%-10% (or higher) in the Klang Valley while new upcoming office buildings were estimated at an average gross cap rate of 6%-7%. The brokerage sees Hap Seng’s acquisition of a 50% stake in Menara Citibank in Kuala Lumpur for RM235.4mil as a fair price. “The estimated acquisition price of RM828 per sq ft would translate into a gross cap rate of about 7.5% for the office space component. “We think this is rather a fair valuation, especially given the fact that the office space market is currently in a transition mode into a tenant’s market,” it said. 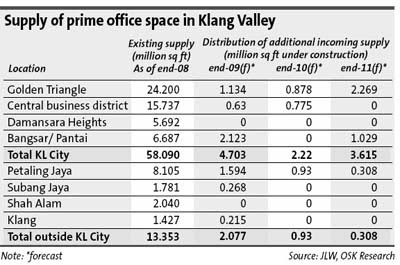 As companies would be more aggressive in cutting their occupancy costs amid the subdued business outlook in 2009, the Klang Valley prime office market would be hit hard by the incoming new supply this year, especially in the decentralised regions, OSK said. However, centralised areas like the Golden Triangle and central business district would likely escape from the over-supply cycle in 2009. OSK expects 2012/13 to be more painful, not only to the decentralised regions but also the centralised ones. The economy during that period would have to absorb the slack left over from the 2009/10 downcycle, it noted. Meanwhile, HwangDBS Vickers Research said it expected more transactions by local investors in the near future, and possibly the return of foreign investors due to the improved global credit markets and economic outlook/sentiments. “We find a return of large commercial transactions following recent positive policy changes to liberalise the Malaysian property sector. The abolishment of local equity requirement for mergers and acquisitions and Foreign Investment Committee approvals is encouraging,” it said. HwangDBS said Malaysia Property Inc, a joint public-private sector initiative, could go a long way in helping to promote Malaysian properties which were still cheap viz-a-vis regional markets with no restriction on foreigners buying freehold properties. It maintains its positive view on the local property sector and developers with significant exposure to the commercial segments, including KLCC Property Holdings Bhd, Malaysian Resources Corp Bhd (MRCB) and IGB Corp Bhd. It recommends a “buy” call on KLCC Property and MRCB with a target price of RM3.70 and RM1.50 respectively, while IGB is not rated by the research house. ECM Libra Investment Research said it anticipated the property sector had bottomed out and was recovering given that several developers had planned new launches after a difficult period over the last 12 to 18 months. It maintains its “neutral” call on the sector and remains selective on its stock picks, preferring mid to small capital property developers where valuation is more compelling. ECM Libra upholds its “buy” call on Sunway City Bhd and Sunrise Bhd at a target price of RM3.60 and RM2.85 respectively. 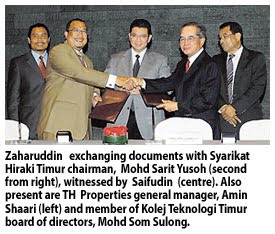 TH PROPERTIES Sdn Bhd, the property arm of Lembaga Tabung Haji, will launch RM50 million worth of shoplots at its Bandar Enstek township in Nilai, Negeri Sembilan, next month. Its chief executive officer Zaharuddin Saidon said this would be the first time it launches commercial units within the development. Bandar Enstek is developed by TH-NSTC Sdn Bhd, a 70:30 joint venture between TH Properties and the Negeri Sembilan State Development Corp. So far 30 per cent of the 2,046ha township has been developed with 1,200 units of single and double-storey terraced houses, bungalows and semi-detached houses built and occupied. The whole development, comprising residential, industrial, commercial and institutional components will be completed by 2025 with an estimated gross development value of RM9.2 billion. "Developments are moving on as scheduled. We feel it's time to add some shoplots to cater for the existing homes. We are positive on the take-up as there is a long wait list," Zaharuddin said. Zaharuddin was speaking to Business Times in Kuala Lumpur yesterday, after inking an agreement with Hiraki Timur Sdn Bhd. Hiraki is the operator of Kolej Teknologi Timur (KTT) and it plans to set-up a campus on 3.2ha in Bandar Enstek, for RM25 million to RM30 million. The event was witnessed by Deputy Minister of Higher Education Datuk Saifuddin Abdullah. Hiraki Timur will move its current main campus in Bandar Baru Salak Tinggi, Sepang to Bandar Enstek when the new facility is ready by early 2012. Zaharuddin said TH-NSTC has, since 2002, received investments of over RM1 billion from the government and private sectors to set up universities and colleges. The Education Ministry and Higher Education Ministry bought 400ha to set up nine colleges and institutions such as Tunku Kursiah College, Aminuddin Baki Institute, Maktab Perguruan Teknik and Pusat Latihan Bahasa Inggeris. The properties are under construction and will be ready between 2012 and 2013. Kuala Lumpur Education City Sdn Bhd, led by Tan Sri Dr Kamal Salleh, is planning Kuala Lumpur Education City, which will feature five foreign and two local universities on 200ha. Cempaka Group of Schools is also setting up an international secondary boarding school for RM95 million. "Our focus plan for the township is a knowledge-based development and we are heading there," Zaharuddin said. PROPERTY developer Glomac Bhd is selling a block of commercial building to Koperasi Kakitangan Bank Rakyat Bhd for RM22.6 million. The sale of the building — the Block B of Glomac Business Centre in Kelana Jaya, Selangor, will result in a gain of about RM4.6 million. “The proceeds raised will be used for the group’s working capital,” said executive chairman Tan Sri F.D. Mansor in a statement yesterday. As a result of the sale, the board of Glomac is proposing to pay a special dividend of 1 sen a share. BEIJING: Property sales in China have soared by over 60 per cent so far this year, the government said yesterday, triggering fears of emerging asset bubbles. In the first seven months of the year, sales of all property were up 60.4 per cent from the same period a year ago, while housing sales increased by 65.3 per cent, the National Bureau of Statistics said in a statement on its website. "The real estate market has entered into a quite sensitive period now and bubbles have risen in some regions," Qin Rui, an analyst with house agency 5j5j here, said. "In Beijing, house prices have far exceeded affordability for most residents," he said. Property prices elsewhere in China picked up further in July, official figures also showed yesterday, as the effects of government stimulus efforts gained strength. Prices of real estate in 70 major cities jumped by 1 per cent year-on-year last month, the statistics bureau said in another statement, issued with the National Development and Reform Commission. That followed a 0.2 per cent rise in June. Until then the index had slumped for six months since December, as it was hit by previous government attempts to rein in prices as well as the global economic crisis. Prices of new houses increased 0.3 per cent in July from a year ago, compared with a drop of 0.6 per cent in June, while those of existing houses went up by three percent, up from 2.2 per cent a month earlier, the statement said. Since October, the government has taken a series of measures, including tax breaks and preferential rates for first-home buyers, to avoid a crash in real estate, which accounts for more than 20 pe rcent of urban fixed investments. In addition, inflation expectations due to a surge in new bank loans this year is also driving the sector's rebound, analysts argued. New loans for the first half of the year amounted to a record US$1.1 trillion (US$1 = RM3.50), recent central bank figures showed. Qin said funds had flooded into the real estate and stock markets as companies sought to exploit easy bank lending policies for quick profits. However, he predicted the government might be forced to tighten its policy, causing a major correction. "China's real estate market ... relies heavily on capital. It will definitely be badly affected once there are changes in the supply of funding," he said. PETALING JAYA: Ahmad Zaki Resources Bhd (AZRB) has secured a RM225.1mil contract from the Public Works Department (PWD) for the development of the Besut campus of Universiti Darul Iman. The project, which is expected to commence on Aug 24 and be completed by Aug 21, 2011, will contribute positively to AZRB’s financial performance in the next two years, the company said in a stock exchange filing. This latest award is the second that the contractor has bagged this month. Last week, it was awarded a RM106mil project from the PWD to build an elevated junction from Istana Negara to Jalan Duta in Kuala Lumpur. In May, it won a RM185mil contract from Saudi Oger Ltd of Saudi Arabia to build reinforced concrete structures for Tower H1-A of the Jabal Omar Development in Mecca.